There is something to be said for a scary movie that can make you legitimately feel chills in the dead of summer. Granted, summer doesn't actually begin until June 21st, but as the third chapter in the Insidious saga somewhat oddly comes to us on the first weekend of June rather than in the midst of fall I was rather cautious as to if this release date was more a strategy to cover up the lack of quality with the excitement of summer or if it was simply time for Insidious to play with the boys of summer. Due to the fact director James Wan, who guided the first two films in the series to great success before taking on Furious 7, exited and both the scripting and directing duties were handed over to Wan's longtime collaborator, Leigh Whannell there was reason to be hesitant. It certainly seems Whannell has at least been paying attention and taking notes since the two first collaborated on Saw over a decade ago as Insidious: Chapter 3 is a sufficient if not significant piece of horror that does its job in terms of getting you to jump at the right time while adding depth to some of the more interesting characters in the previous two films. The downfalls aren't so much downfalls in that they make the movie any worse than it might have been, but more in the fact they simply allow the film to be adequate and exactly what one would expect without striving to be anything more. This makes for a rather pleasant viewing experience that fulfills expectations and plays into ones predictions for how things may go, but unlike Chapter 2 it doesn't delve narratively into new territory, but more recreates the first film with a new set of characters that just so happens to take place prior to the events that occurred in the Lambert household. Lin Shaye is your connective strand as psychic Elise Rainer tough she is hardly the central character. What is more disappointing than anything is that this third film doesn't take on the story that was hinted at in the end of Chapter 2 that might again deal with the red-faced demon from the original, but instead seems to be saving that for the fourth film inevitably making Chapter 3 feel like little more than a footnote. as Sean Brenner (Dermot Mulroney) looks on. We are introduced to Quinn Brenner (Stefanie Scott) as she attempts to connect with her dead mother with the help of Rainier. At this point in time, the prequel point in time, Rainier refuses to help the young lady, but it seems Quinn is already beginning to notice paranormal events happening around her. Despite her hesitation, there are attempts made to contact Quinn's mother as Elise feels rather compassionate for her given the circumstances of her situation, but she digresses after coming into contact with the dead, and one man specifically, who occupy a realm in the further that isn't necessarily of the light. Despite this failed attempt, Quinn attempts to continue on with her everyday life, first and foremost thinking of what she might do after high school and taking it upon herself to audition for a theater company in New York. Her father, Sean (Dermot Mulroney), and brother, Alex (Tate Berney), seem to care little for what her future holds but instead hope to keep Quinn around as long as possible to keep things afloat in their lives in the wake of their wife and mothers passing. It is at the audition where Quinn begins to not only feel the presence of something supernatural, but to see things out of the ordinary. This mirage of a figure causes an unsuspecting Quinn to be hospitalized in a fashion that will no doubt elicit a strong reaction from a large audience. It is no doubt an impressionable way to kick off the tone of the scares you want to include in your movie and Whannell is sure to leave a mark. With the injuries that Quinn sustains she is left unable to escape from this demonic presence that seems to be chasing her. After Sean finally witnesses one of these vicious attacks firsthand he returns to Elise, begging her to use her abilities to try and contact this parasite that has latched itself onto his daughter in hopes she might be able to stop these attacks. Scary movies are all about atmosphere. I've talked about this before, but both where and when you see a scary movie combined with the kind of audience you see it with truly influences the kind of experience you have and even your perception of quality when the number of scares is integral in determining the overall quality or how well it achieved its main objective. 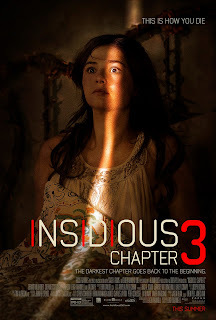 I have no doubt that the enthusiastic crowd I saw Insidious: Chapter 2 with aided my enjoyment, but upon re-watching the sequel with only my wife at home I felt justified in my take-away from a story perspective. With the third film I wasn't part of an auditorium that was nearly as excited as they were for the previous film and instead seemed to feature an older crowd rather than the largely teenage audience one that I shared Chapter 2 with. Still, while this may not create as much of a memory around Chapter 3, I again feel confident in the perspective that this third film is more or less to form if not slightly above average. There is something to be said about the psychology of scary movies and why people enjoy subjecting themselves to horrors on their own free will and taking some kind of enjoyment away from it and Insidious: Chapter 3 would be an ideal candidate to use in a study as to why this is true. There are moments of real terror, true jump scares that don't rely on the same tricks we've seen a thousand times before, but instead actually put us in the middle of the frightening scenario and make our skin crawl. At the same time, this is a wholly enjoyable thrill ride that plays to the aforementioned expectations in that Quinn is your standard horror movie heroine as Scott effortlessly gives her good character with whom we easily sympathize, but still falls into the typical trappings of these kinds of movies. We know when the scares are coming and even who they're coming from as Quinn looks out her window or under her bed and we know she listens to the crazy cat lady next door (Phyllis Applegate) when no one else gives her credence, but we are still willing to go on this journey with her because its more or less entertaining even if it doesn't push the bigger mythology of the franchise any further. Quinn Brenner (Stefanie Scott) has been targeted by a dangerous supernatural entity. Whannell has been writing horror long enough now to understand the clichés of the genre and so he plays with our expectations here to a degree while the actors do well to balance the horror and the inherent humor of the situations. In all the practicality of movie making it is hard not to laugh when trying to create something outlandishly scary and even moreso when those scary elements include the kind of costumes in play here. Still, Whannell relegates both his and Angus Sampson's characters, intended for comic relief, to smaller than usual supporting characters that simply serve to provide an origin of their partnership with Elise and justify why her talents are indeed crucial. It is in Elise that Shaye still serves as the heart of the series and carries the third act of this film to a glorious defeat of the demonic spirits that haunt our protagonist while at the same time giving a more plausible sense of conclusion to the characters than the second film was able to do. The key here is that Shaye is so dedicated to the sincerity of Elise's gifts that she never comes off as ridiculous as it might easily be to take her. She, in many ways, allows the audience to buy more into the supernatural and spiritual aspects of the film and it's further than the guys and girls in all the make-up. When we see the further we see a metaphorical representation of hell, but when Shaye delivers her dialogue we can almost see the actuality of this netherworld more vividly. That Elise was killed in the first film has given this franchise more than a few obstacles in keeping her character in the loop, but Whannell did a superior job of explaining this in Chapter 2. In making this a prequel though he more or less takes the easy way out. For me, Chapter 2 did more than justify the need for explanation as it delivered both plenty of new elements while cleverly revealing reasoning for some of the questions left over from the first film. 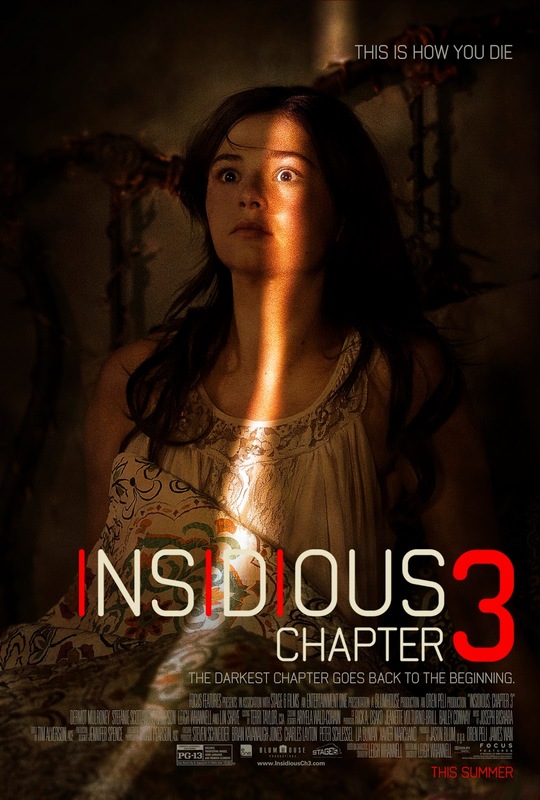 While Insidious: Chapter 3 is a fine enough film it is the worst in the series by default because it dares to do nothing different or give us anything new.